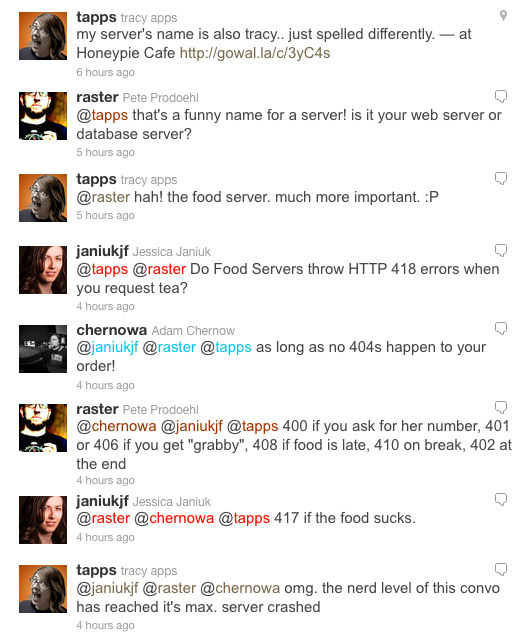 As long as we’re on the subject, I thought I’d expand on the whole “Server Error” joke and attempt to come up with a restaurant/food/server joke for every HTTP code. Informational 1xx – This is when your server introduces themselves to you. 100 Continue – This happens if you interrupt the server before they tell you the specials. 101 Switching Protocols – If the server realizes you are being difficult, stupid, or drunk, they may change the way they talk to you. Successful 2xx – Hooray! You’ve managed to interact successfully with your server. 200 OK – Server is OK, hasn’t screwed anything up yet. 201 Created – You’ve decided what you wanted to order, and told the server. 202 Accepted – The server has accepted your order. 204 No Content – This is what happens when you are not content with your food. 205 Reset Content – This is what happens when you send the food back. 206 Partial Content – This is what happens when the server forgot something you ordered. Redirection 3xx – This is what happens when the server starts coming towards your table, but turns and goes the other direction. 300 Multiple Choices – Typically, this will happen when they list the desserts… Choosing is quite difficult! 301 Moved Permanently – Occasionally you may want to move to another table, perhaps by the window, or the fireplace. 302 Found – Hooray! You thought you lost your server, but you found them. 303 See Other – This is what happens when you try to order from an employee who is not your server. 304 Not Modified – This is what happens when you send it back and then they return it without doing anything to it. 305 Use Proxy – This is when you have someone order for you, you know, if you have to go to the bathroom or something. 307 Temporary Redirect – This is when you make everyone else order before you because you haven’t decided yet. Client Error 4xx – Oops! You’re the client, you’ve done something wrong… You probably pissed off your server. 400 Bad Request – Again, you screwed up. Did you try ordering a steak at a vegan restaurant? 401 Unauthorized – This is what happens if someone tries to order for you but you stop them. 402 Payment Required – Most restaurants rely on this one. 403 Forbidden – Asking your server for his/her phone number. 404 Not Found – Server is missing… probably on break. 405 Method Not Allowed – This is what happens if you try to order the kids meal when you’re a full grown adult. 406 Not Acceptable – If you get “grabby” with your server, well,that’s just not acceptable. 409 Conflict – You really want the lobster, but you also really want the streak. Can’t have both! 410 Gone – Server has quit. Probably on a bus half way home already. 411 Length Required – This one is typically only used when ordering subs. 413 Request Entity Too Large – You know that 72 ounce steak that they give you, and if you eat the whole thing your meal is free? Don’t do it! It’s too large. 415 Unsupported Media Type – Don’t try ordering your meal by singing. 416 Requested Range Not Satisfiable – You want free range beef. They don’t have it. 417 Expectation Failed – Your meal sucked. 501 Not Implemented – Not everything comes deep-fried and/or covered in cheese. 502 Bad Gateway – Typically an error between the server and the kitchen. 503 Service Unavailable – Server is not serving. See 404 and 410. 504 Gateway Timeout – This happens when the server gets too busy to relay your order to the kitchen. Posted on Thursday, February 17th, 2011 at 1:00 pm. Subscribe to the comments feed. Both comments and pings are currently closed. Post on your own blog.